A well thought-out selection of components that will make your room workable within hours. Simple adhesive-free installation. Does not kill the natural acoustic. More aesthetically pleasing than foam. Doesn't solve all your acoustic problems. As artists, engineers and producers have come to regularly rely on small non-purpose built spaces they have inevitably faced the ugly reality of uncontrolled small room acoustics. 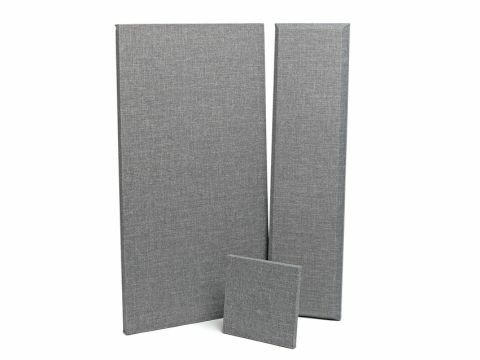 The Primacoustic London 12a Studio Kit on review here provides a basic all-in-one solution to address this issue and create an acoustically-controlled work space from a standard untreated rectangular room. This impressive, bulging kit comprises two large Broadband panels (2ft x 4ft) that mount as corner traps on the source wall, a set of eight long Control Columns (1ft x 4ft) for mounting to the side walls and source wall as reflection attenuators, and 12 thinner square Scatter Blocks (1ft x1ft) to create a checkerboard pattern on the rear wall that gently reduces reflections and flutter echoes. You get all this plus the anchor fixings required for wall mounting. Primacoustic even throws in a drill bit too. The panels themselves are all made from rigid fibreglass wrapped in micromesh and covered in a loose weave fabric that comes in three inoffensive colour choices: black, beige and grey. The rigid fibreglass attaches to the walls with metal 'impalers'. These mounting plates have sharp triangular darts protruding upward and outward upon which one can impale the panel. Thanks to this simple installation process anyone with a drill, screwdriver and spirit level can fit the entire London 12a kit in a couple of hours and have a pro-looking and sounding installation. We installed the London 12a kit in the shell of what will be a studio control room (14m²). Basic measurements were made at nine points around the room before and after the installation with slow sine wave sweeps and white noise as well as standard listening tests. The results were positive and essentially fulfilled the design criteria for the kit. Firstly, the stereo image sharpened as side reflections reduced. The cutting back of early reflections helped keep transients clear, in turn increasing the perception of depth and clarity from the monitors. The front and back reflections and associated flutter echoes were reduced considerably and helped keep the direct monitor source well above any secondary sound source, thus reducing mid-range masking effects. After installation the room definitely felt more controlled without seeming at all unnatural or dead. To give a standard small room anything close to the level of acoustic control achieved in well designed pro studios requires a good deal more materials and reflective and absorptive solutions than the London 12a kit provides. That said, the kit does deliver a significant improvement over any non-treated room and provides a great platform that can easily be augmented to inch up the acoustic performance and tweaked for specific case perfection. And at this price it's an instant, controllable and worthwhile solution with zero guesswork or fuss.